When Outlook starts, it needs to access and lock its data files (PST or OST files) in order to read & write to them. If your data files are already being accessed (or locked) by other applications, Outlook will hang on “Loading profile…” while waiting for the data files to become available. There is an earlier Outlook process / session that still runs in background, locking your data files. Solution: start the Windows Task Manager and kill (end process) the outlook.exe processes that are running, then try again to start Outlook. While this situation shouldn’t happen, it does. For example, it is notorious that SonicWall VPN might cause Outlook to stop loading and the only solution is to uninstall SonicWall. 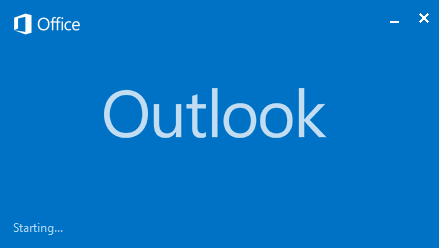 If Outlook used to load fine until recently, check the applications that you installed or updated in the past days and uninstall them to see if the problem gets solved. For various reasons, your Outlook data files may become corrupted. Normally, if Outlook determines that its data files are corrupted, it should immediately start the data file repair process. Unfortunately, it doesn’t always determine that a data file is corrupted, so Outlook hangs up while loading. To solve this issue, run the ScanPST tool available with the Outlook installation. If your hard disk is damaged or if you recently had to deal with some viruses, your Outlook files may have been damaged, causing Outlook to hang while loading. To repair your Outlook installation, simply go to your Windows Control Panel -> Programs (or Add/Remove Programs, depending on your Windows version), find the Microsoft Office installation in the programs list and choose to repair it. Please note that, depending on your Office version, you may need to provide the Office installation disk. Also, if somehow your Outlook settings are damaged (usually because of a 3rd party software or add-in), you should try to load Outlook in safe mode. To launch Outlook in safe mode, simply hold the CTRL key and double clicking on Outlook icon to run it. If Outlook starts fine in safe mode, you need to check if there is a conflict with a 3rd party program (see above). Have you found a different solution to your Outlook “hang on loading profile” issue? Please post your comments below, so other people can benefit from your experience! Thank you so much! I’ve looked at several solutions to this issue, and this is the only thing that actually worked for me! Select the Graphics key you just created, right-click in the right panel and choose New > DWORD (32-bit) Value and name it DisableHardwareAcceleration. Double-click the new value and assign it a value of 1. Close regedit and try opening Outlook again. I could not find any of the programs listed here… but in the end the last solution (bring up control panel and select “Change” for Microsoft Office) was the one that did it. I ran the “fast fix” scanner and now all is repared! What about when it hangs contacting a server? I’m stuck this morning “Contacting https://gallery.mailchimp.com//ima….. I’m assuming that my Outlook is blocked because it’s trying to download an image from a third-party server? That is totally incompetent and ridiculous.